Today is our second last day, and we had high hopes. After a couple short days, the next two were going to be long hauls, as we made our way all the way to Edmonton for our flight home. As much as we had enjoyed Liard Hot Springs, it was time to hit the road. We were up early and ready to go by 7:00. Today's drive was one of the most spectacular that we have had on the trip. It was helped by bright sunshine, and the mountains were cloaked in gold. Not far into our drive, we saw a female moose on the side of the road, we were by it before we could stop to take any pictures. The colour was spectacular at the first stop we made. This was the trailhead to the salt lick, where we saw some thinhorn sheep. Close up look at a couple of thinhorn sheep. 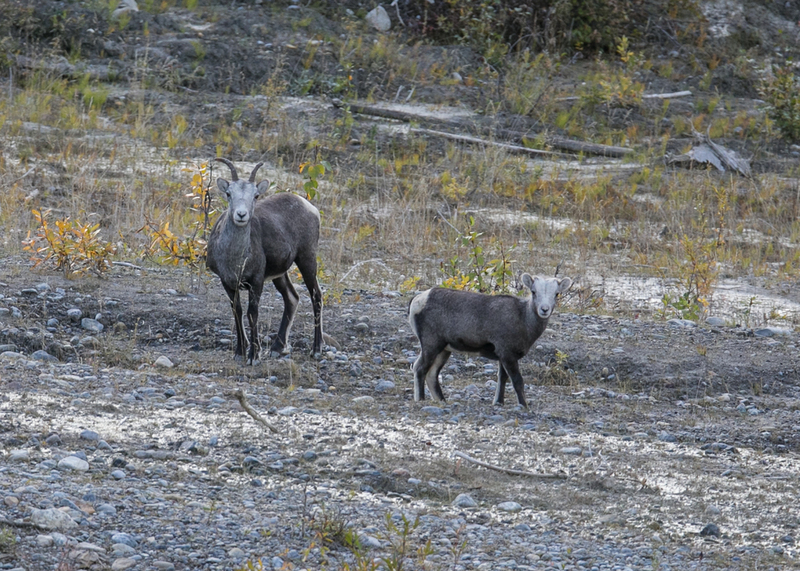 A little while later, just inside the boundary of Muncho Lake Provincial Park, we made a stop for a short walk to a mineral lick, where we saw three stone sheep. The first two were on the slope of the hill, down from the path. 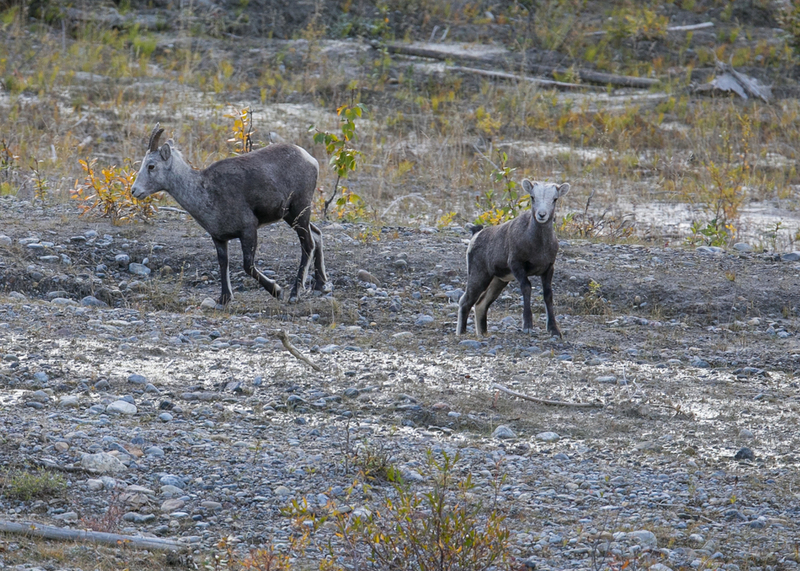 We could see them - a female and her young - and they were well aware of us. But as we were pretty far away they weren't that worried about us. We were able to see them from a distance before continuing on. They were still there after we got back from the viewpoint, and I was able to find a trail that took me out to where they were, and they let me get quite close before I decided to come back to where the rest of the family was, back on the trail. Mom, moving a little away from me as I got closer. At the end of the path was a lookout with a great view of the valley and mountains. The view was amazing, and the colours were spectacular. There was another (I think there was only one) thinhorn sheep at the bottom of the cliff, that you could see when the angle was right. It was kind of funny, as it knew we were there, but wasn't worried as long as we stayed up top. The view from the lookout, looking up the valley into the mountains. Fall colours in the valley, from the lookout. The occasional view of the thinhorn sheep at the bottom of the cliff. The sightings continued a little while later, as we saw some more sheep along the road, but didn't stop for any pictures. Pretty soon we were treated to views of Muncho Lake. The road brought the views of the lake in-and-out, and the lake looked amazing. View of the very blue waters of Muncho Lake. From a distance, it was hard to tell what was swimming across the very big lake. We made a stop at Muncho Lake, at the Strawberry Flats campground, at Muncho Lake Provincial Park. It gave us some nice views out over the lake. Surprisingly, the campground was pretty much empty. We didn't stay too long, as we had a lot of ground to cover. Poor quality photo, but a closer look at our swimming caribou. The scenery got better and better as the sun got up above the mountains. 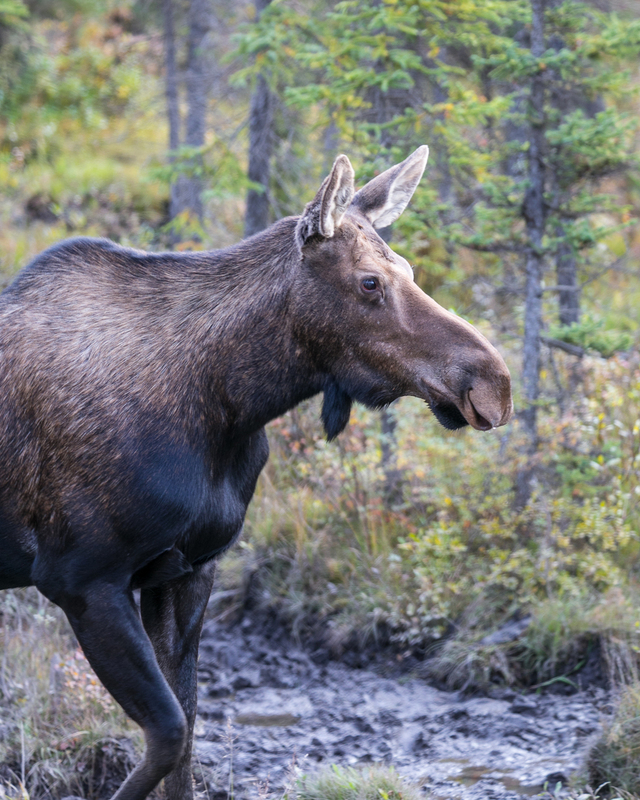 We saw another female moose, and were able to stop to have a good long look at her. She wasn't too worried about us, and was right on the side of the road. It made for some good photos. About this time, we also went through a stretch of just spectacular scenery. The road was winding through the mountains, there were beautiful blue rivers, and the sides of the hills were covered in trees that were turning brilliant gold. It was just amazing. 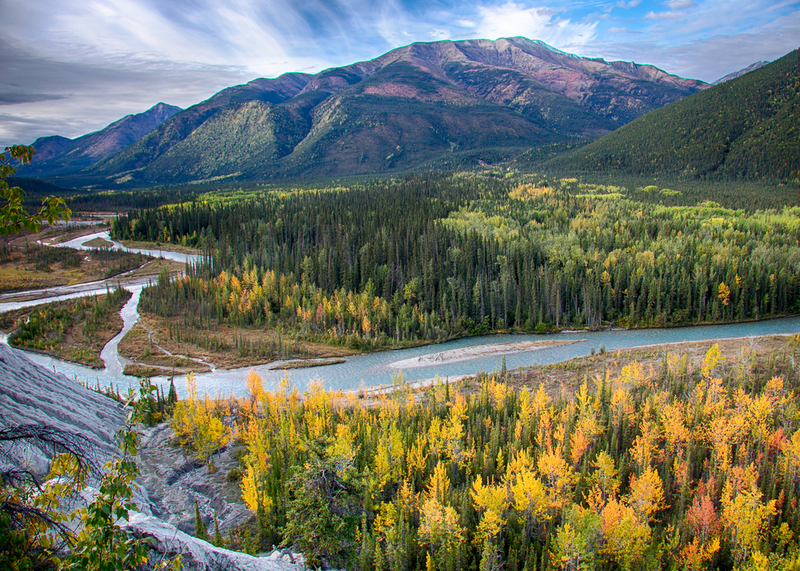 The fall colours on the mountain were stunning, and we were blessed with a brilliant blue sky. 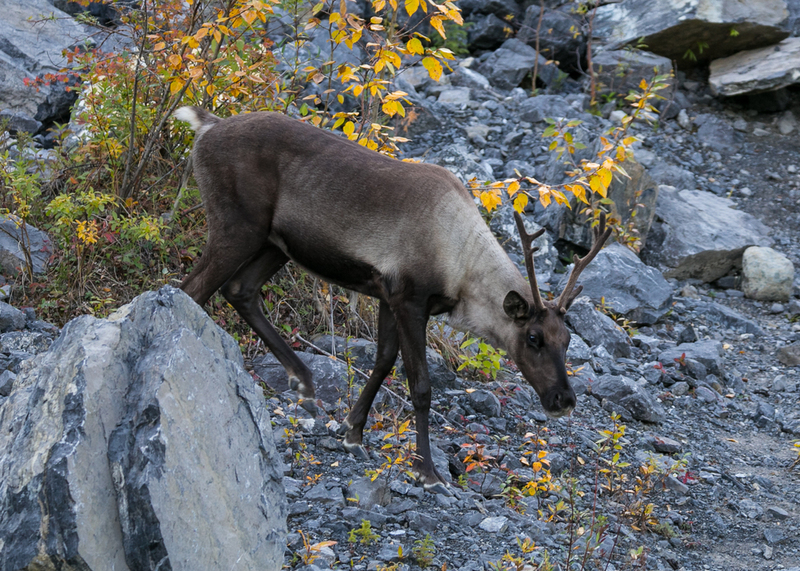 Our next sighting was a small herd of caribou! They were spread over a couple of spots, but there were 3-4 in each spot. They were all along the side of the road as well, and we were able to pull over to see them. It was pretty awesome. 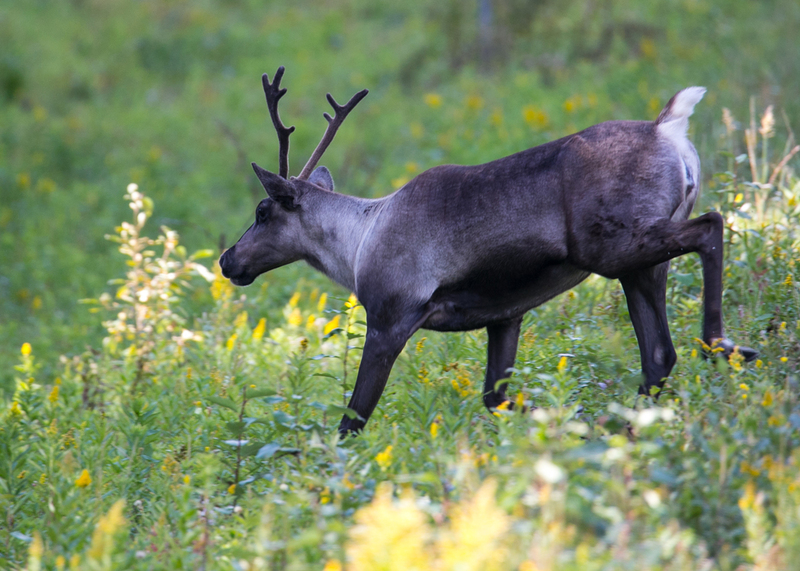 I don't think I'd ever seen that many caribou in the wild, that close up. The dumb things were right on the road as well in a couple of spots, and one time a huge truck went flying through, not even slowing down. 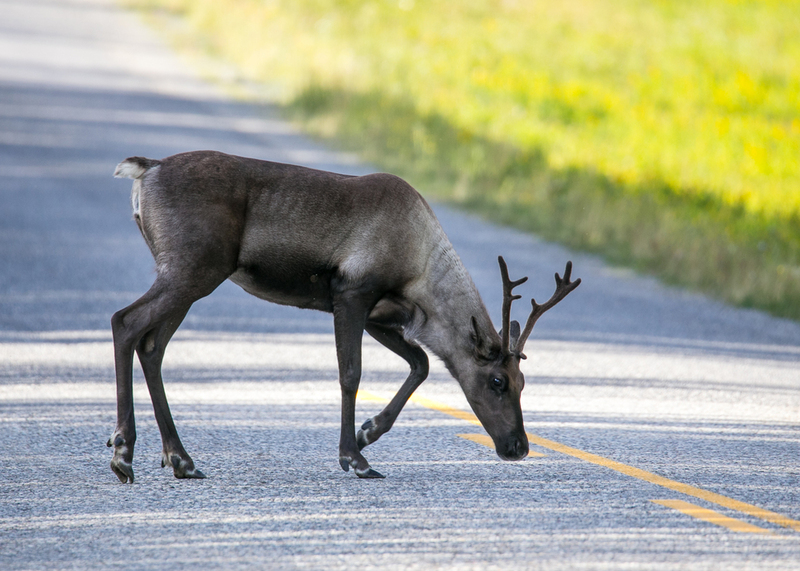 While it bugged me with the bison, it really annoyed me with the caribou, that would be much more vulnerable to a traffic accident. 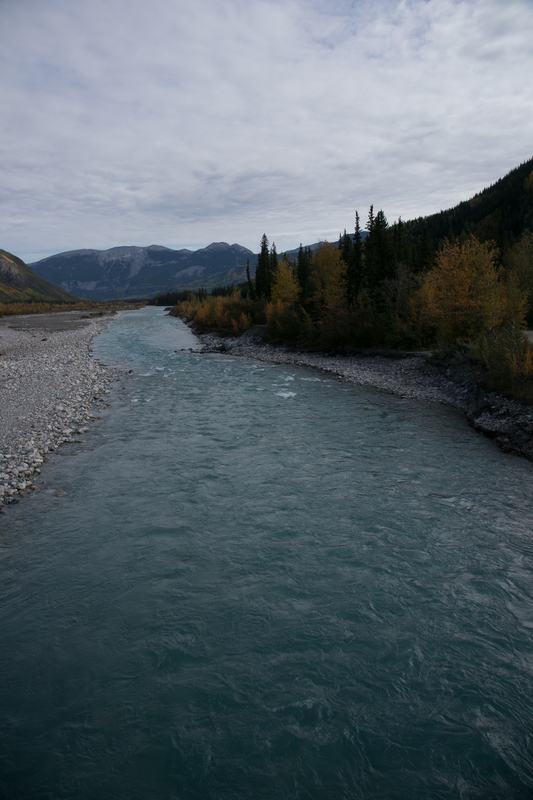 Not long after the caribou encounter, we made a short stop at a point where a river cut across the road. The water was so blue in the river, and there were mountains in each direction that provide a stunning view. It needed some pictures, and I got Dad to stop for a bit. The water in the river was so blue, we just had to stop! We continued up into the mountains, and soon saw another herd of stone sheep - 4 of them - along the side of the road. They were not at all fussed, and I got some good pictures. A small herd of thinhorn sheep. A couple of young ones, I think. We went through a huge stretch of road construction just outside of Fort Nelson, and had another pilot car to take us through. You could see that the scenery was changing rapidly as we continued south. Less colour, more green but still spectacular. Around 2:00 we cruised into Fort Nelson. We stopped for lunch, got gas and continued on our way. This last stretch wasn't as exciting, and we still had a lot of ground to cover today. The drive after lunch was even less interesting. Long, a lot more flat, and not a lot to see. It was a four hour cruise into Fort St. John, and the Charlie Lake Provincial Park where we were staying for the night. Our last campsite was a great one! The park itself was really nice, and we scored a great campsite, nice and private and tucked in the trees. As it was our last night, we made a great dinner and sat outside to enjoy it. We tried to go for a walk down to the lake after dinner, but it was too dark, so we settled for a last campfire and enjoyed the clear, cool and dark evening. The forest around our campsite was also heading into fall colours.